On a different field of play, Jack coached junior varsity football at Amphitheater High School (1949-51). He officiated college football for 28 years, including 10 years with the legendary Border Conference and 18 years in the Western Athletic Conference. Back on the court, he blew the whistle for 24 years in college basketball in both the Border Conference and WAC. He also spent many years officiating high school and junior college football and basketball. 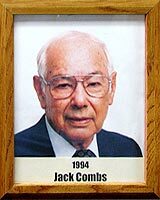 A longtime Tucson resident, Jack was on hand to call the fouls at the NCAA Basketball Tournament First Round Games in 1958 and 1964. Once again on the gridiron, Jack was a referee at the 1976 (Pittsburgh vs. Kansas) and 1982 (North Caroline State vs. Texas) Sun Bowls.